Address: Avenida El Traves, s/n, La Massana, Andorra. 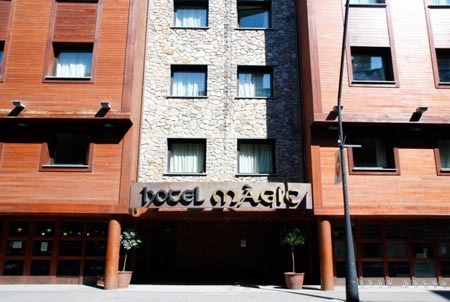 The seasonal Magic La Massana Hotel is set in the village of La Massana and is 15 metres from the ski lift to Andorra's Vallnord Ski Resort. It has a gym and a wellness area, with a Turkish bath and hot tub for an extra cost. It is around 5 km from Escaldes-Engordany, home of the famous Caldea Thermal Spa. Each of the hotel’s rooms are equipped with free WiFi, central heating, and TV with satellite channels. The bathroom comes with bath and hairdryer. Magic La Massana has a buffet restaurant, serving typical local cuisine. There is also an Irish-style pub on site and 24-hour reception. The hotel is surrounded by mountains, and is an ideal base for exploring the Pyrenees. Skiing, snowboarding, cycling and hiking are all popular activities in the area depending on the season. There is also a bicycle storage, washing and repair station. Guests are required to show a photo identification and credit card upon check-in. Please note that all Special Requests are subject to availability and additional charges may apply. Please note, the use of the spa carries an extra cost. Please note that it is mandatory to wear flip-flops and a cap in the wellness area. Please note, drinks are not included in the meal plans.